I was at the Hultgren Q&A session at the Arcada on Tuesday, April 18, 2017. 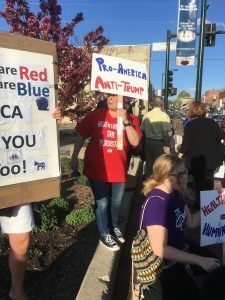 I actually went to the rally across the street, organized by Progressives of Kane County that was scheduled before the event, held a sign for a while, and really appreciated the passing cars honking in support. There were lot of attendees there from Fox Valley Indivisible, Action 14th District IL, Kane County Indivisible, and more, so i hope I have the actual organizer right. 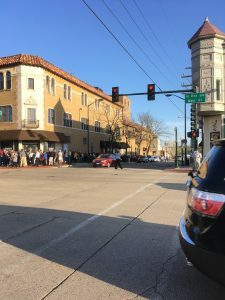 The rally was the only real opportunity the evening afforded to speak up – and appropriately and accordingly named the Hear Our Voices Rally – because the rules of the Q&A specified that only Hultgren was allowed to speak. There were some really interesting speakers at the rally. Perhaps I should have been taping all of them, instead of holding a sign, but by the time I thought of that we were down to the last speaker and I just managed to catch the tail end of her remarks. You can watch that here on YouTube. I was wavering about whether or not it was worthwhile to attend the Q&A where the rules allowed Hultgren six minutes for opening remarks, then three minutes to answer each question, but allowed the attendees to do nothing more than write questions down on cards. It was really more of a one-sided debate than anything, which may have been inevitable as it was coordinated by those perennial debate organizers, the League of Women Voters. As the rally was winding down and while I was still trying to make up my mind, I thought I’d wander across the street and take some photos of the line, which I could see from my position across the street had already stretched around the corner and out of my sight. I ended up taking video as I walked the length of the line as well. It’s here on YouTube. After I had walked to the end of the line taking that video, I walked back to the front of the line, saw them say people could start going in, and walked back to the end and got in line. When I eventually passed in through the doors, they were telling us we could go up to the balcony if we chose. That caught my attention, as the theater seats 900, but the advance notices had said they would seat up to 800. As the advance notices also said the balcony would not be opened I figured that accounted for the difference. As you can see from this photo, the place was packed and the balcony was indeed occupied. 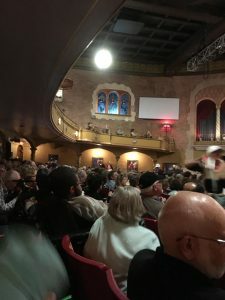 By the time the event started I could not see a single open seat, so I’d say there were at least 800 in attendance, and we might even have hit that 900 capacity. I recorded the whole thing, with the exception of a minute or two dropped out due to inadvertently powering down my cell phone. Again, I really think this was mostly just a one-sided debate. Audience members did provide the questions, and I want to give the LWV credit for choosing good ones out of the more than 400 they estimated were written. Once or twice they did do follow up questions as well, but for the most part it gave Hultgren all the opportunity he needed to recite his talking points. He did exactly that, often going off on tangents that were semi-related to the question, without answering the actual question. I think it’s important that this event happened though, as there were several points where Hultgren was induced to give an answer about a position or a potential vote that we now have on record, such as the question about budget cuts wherein the moderator asked him for a straightforward yes or no answer to potential cuts to various programs. In the meantime, I’d encourage everyone to keep calling, emailing, faxing, writing, doing whatever you can to push Hultgren to conduct an actual Town Hall. His contact info is here.